How to update the title tag in page properties on existing pages? When updating an existing page, you many need to update the title tag for the page. You may need to do this because the text of the page title has changed or because the page title was entered incorrectly. Second, click the Page Properties button in the tool bar. 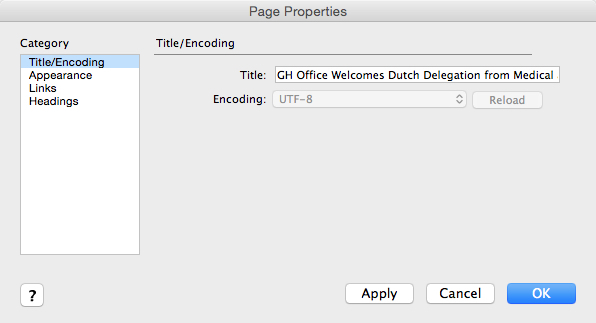 The page properties dialog box will now appear with the title tag in the Title field. 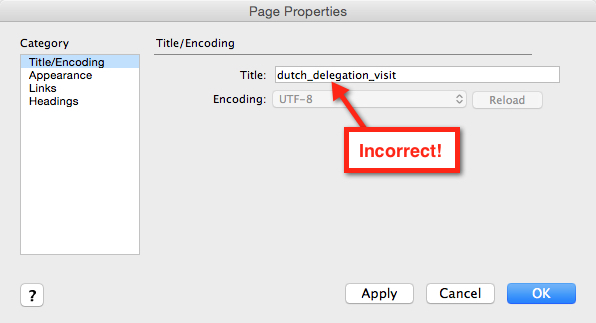 The example below shows where a file name was incorrectly entered as the title tag in the Title field. Enter readable text in the page title field. This is the text that will appear in the title bar at the top of the browser window. If a visitor adds your page to their favourites (bookmarks), this page title is the default name it will give the bookmark. Search engines use this page title as the listing name for their results. In HTML the page title is delimited by the <title>Your page title</title> tag. It is better to keep the text of the page title as brief as possible. After you enter readable text in the Title field, click OK. Complete any other changes you need to make to the content on the page. Last, click Publish. The updated page is now on the server.